July 18, 2016 – Hey friends! Emily Caruso from Jelly Toast blog here, and today I’m showing you how to create these sweet and spicy Tropical BBQ Chicken skewers. I used a few of my favorite ALDI staples including SimplyNature® Organic Original BBQ sauce, some BERRYHILL Sweet Orange Marmalade, Never Any! Boneless Skinless Chicken Breast and of course fresh produce including bell peppers, pineapple and red onion. 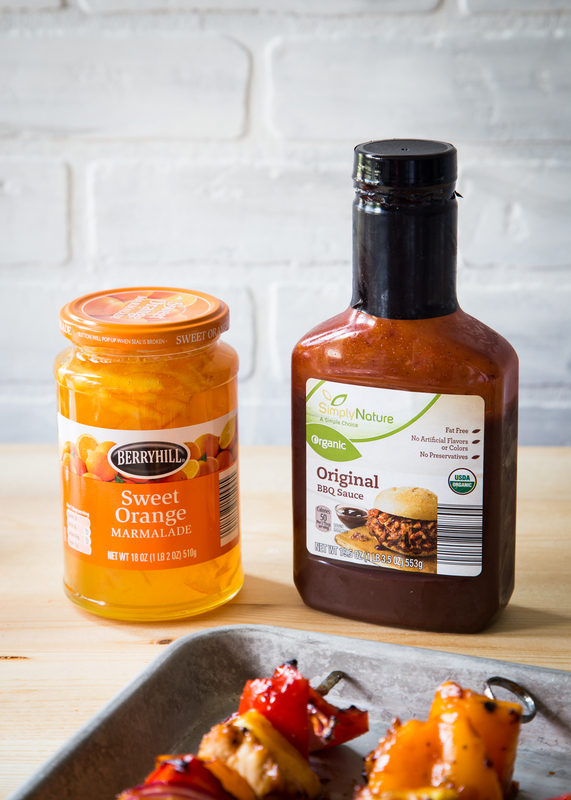 In a medium sauce pan set over low heat, combine SimplyNature® Organic Original BBQ Sauce and BERRYHILL Sweet Orange Marmalade and stir until marmalade is completely melted. Remove from heat and set aside. Place Kirkwood Never Any! Boneless Skinless Chicken Breast cubes into a medium sized bowl. Pour half of the BBQ sauce mixture over the chicken and stir to combine. Reserve remaining sauce. Assemble remaining ingredients at your work station along with 8 metal BBQ skewers. 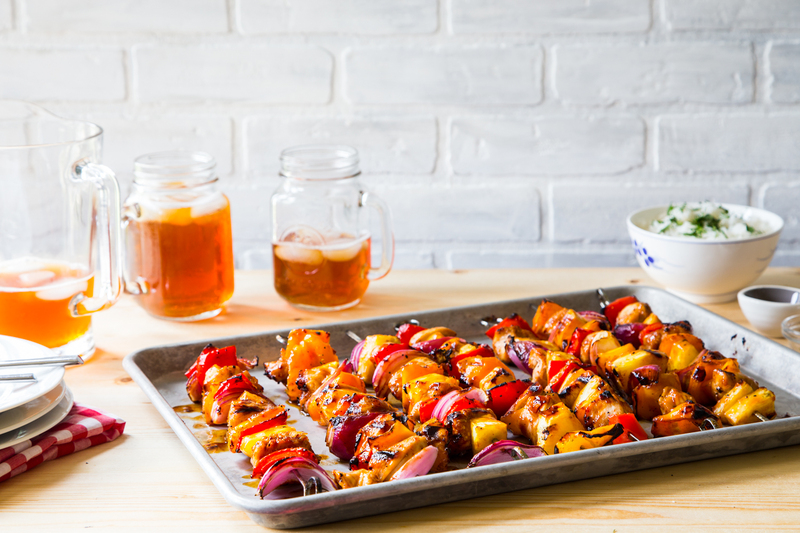 Skewer chicken, peppers, pineapple, and onion on the skewers in an alternating pattern until all ingredients are used. Sprinkle skewers with salt and pepper. Spray gas grill grates with Carlini® Olive Oil Spray. Turn grill onto high heat for 5 minutes, then reduce to medium. Place Tropical BBQ Chicken Skewers on the grill and cook for 5 minutes per side, or until chicken is cooked throughout. Baste skewers with reserved BBQ sauce mixture on each side during cook time. I haven’t tried these but made your recipe using the Aldis meatballs and the peppers. I added onion wedges too. So good we have made the 4 times already. So simple and so good.